2009 "Many a woman with One" Calendar is the brainchild of Dorota Kiałka i Kamila Żurawska. 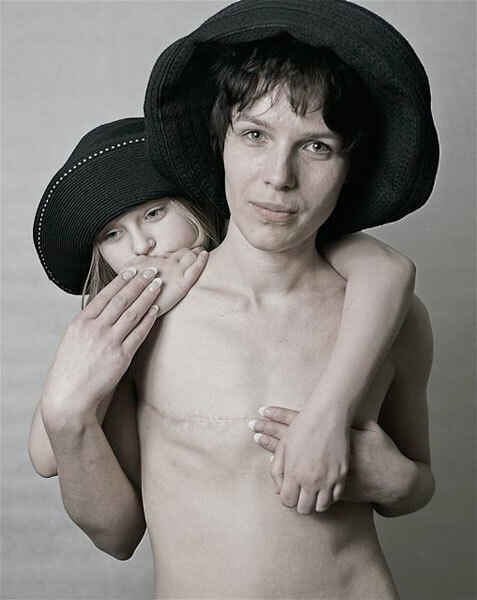 Dorotka is a BCS who lost one breast when she was 31 and this is the reason why the subject of the young BCSs, became so close to her heart. Inspired by my calendar showing women after a mastectomy, she decided to ask young BCSs to pose for a second edition of the BCS Calendar: 2009 "BCSs Young - Many a woman with One". She resolved to invite twelve different photographers, all women, who would make a session with one BCS each. I worked with Joasia and her two daughters, Maria and Milena. Quite unexpectedly the "Many a woman with One" project spawned a separate project called "Daughters of BCS". Initially Dorota's invitation to pose for the calendar, was a springboard from the illness and everything that came with it. It became a mission to bring help to others suffering from breast cancer, who do not know how to deal with it. Taking part in the project made me find a distance from myself and find a greater sense in the illness. I also wanted to prevent my daughters from living in fear of the suffering from the illness. To my daughters and myself the calendar became a continuing adventure that is still ongoing. When posing naked in front of a camera I felt a bit uneasy, though I did not show anything more than the project required. The aim and the message became more important than my personal unease. I think our aims were successfully achieved and I am proud that I could be a part of the project, together with my little daughters.